The lunch differs from similar offerings in other places in many ways. Firstly the lunch is served packed in a cute three tier tiffin box, a container so familiar to many of us during our school going days. The neatly packed box is also ready to deliver – Olive is planning to start delivering the quick lunches pretty soon. Secondly, the lunch is predominantly rice based – which is a new for Olive. I believe many customers keep on asking for rice based dishes other than the risotto offered on their menu, and this new lunch from Olive will satisfy their need. The menu for this new lunch box has three sections. 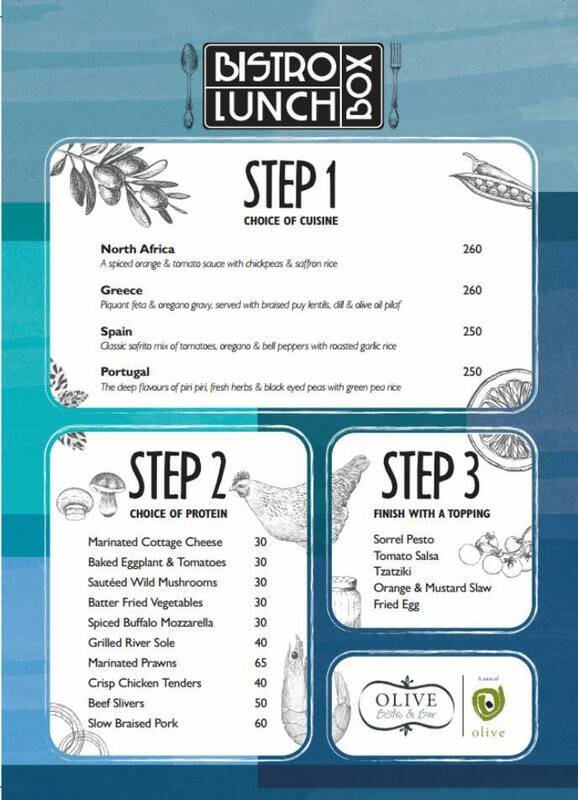 To start with you have to choose one rice dish from four different cuisines – ranging from saffron rice from North Africa to garlic rice from Spain, Portuguese Peri Peri and herb flavoured rice and pilaf from Greece. The second step makes you choose your protein – and there are five each of vegetarian or non-vegetarian items to choose from. And finally, one can choose a topping from choices like Tzatziki or salsa. As a result a customer can try out many combinations of theses three choices, and work out their own favourites. Invited for a trial, I ordered a combo of North African rice, slow braised pork and Orange and Mustard Slaw. 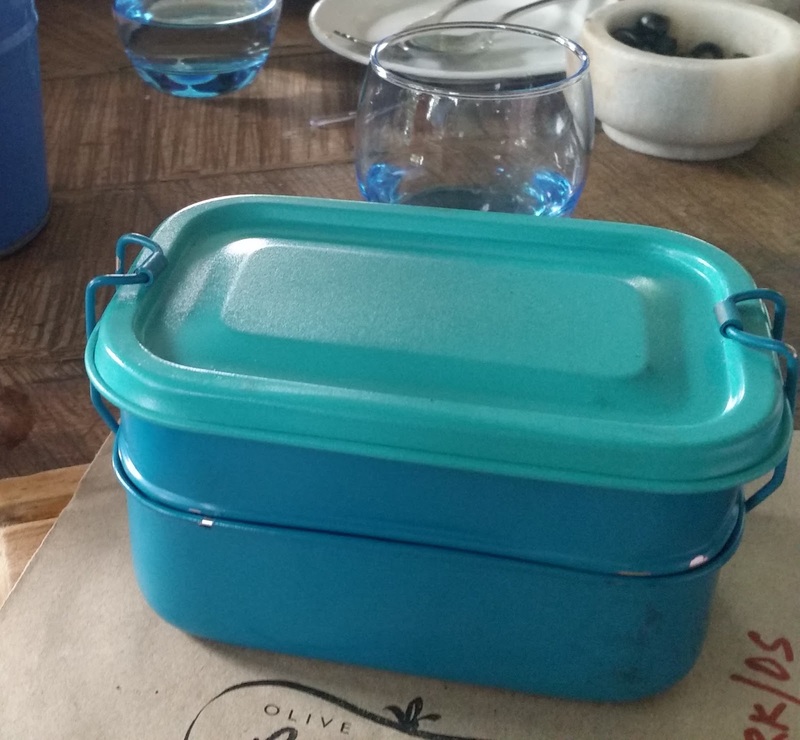 Soon a turquoise blue colored metal tiffin box was neatly placed in front of me. 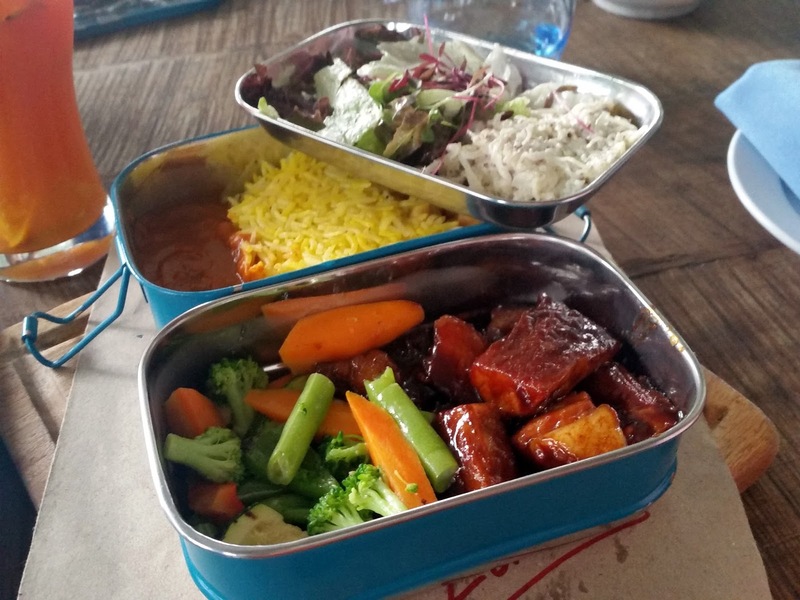 The box had three compartments – the deep one had the pork with sautéed vegetables whereas the saffron flavoured rice was served with an orange gravy. The combination worked out well for me, the star being the slow braised pork. The dark marinade in which it was prepared tasted especially lovely with the pork fat. I got a nice thrill out of eating from a tiffin box after a long time. The anticipation of opening the box to see what is inside as well as tidying up and repacking the box at the end of the meal brought back childhood memories. Soon I wanted to try out a second box – my choice next was the Portuguese rice with peri peri sauce served with marinated prawns and fried egg. 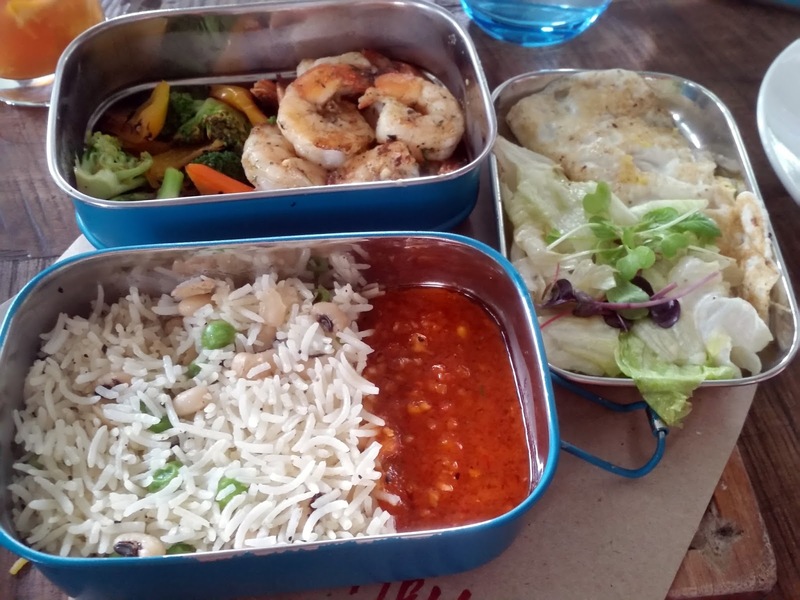 The flavoured rice in this combo stole the show, but would have loved if the prawns had soaked in a bit more of the lemon zest and herbs marination. There were some other food enthusiast friends with me. The vegetarians raved about Baked Eggplant and Tomatoes, and among the toppings Sorrel Pesto was appreciated by almost all. At the end of the lunch we were offered their signature Insanity Cake and Vanilla and Melon Panacotta. Whereas the lunch may just be sufficient for an average eater and for people who do not want to stuff themselves on a busy afternoon, it may not suffice if you are very hungry and want to go for a sumptuous meal. One can possibly go for three combos and share between two people. It is also a great choice for people who like to try out new cuisines and flavours. The flexibilities in the combos ensures that you do not get bored of this lunch very easily. 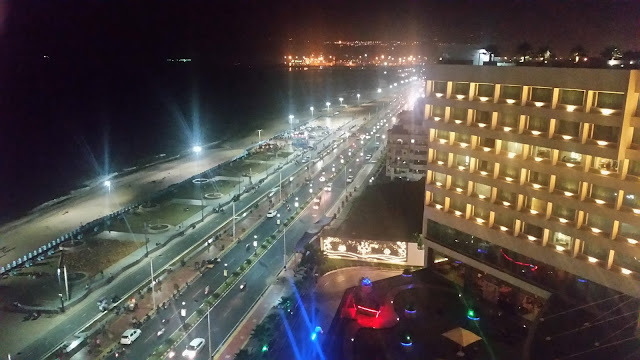 The lunch is priced at around Rs 300 plus taxes and are available during weekdays. Very beautifully described each and every details with pic. 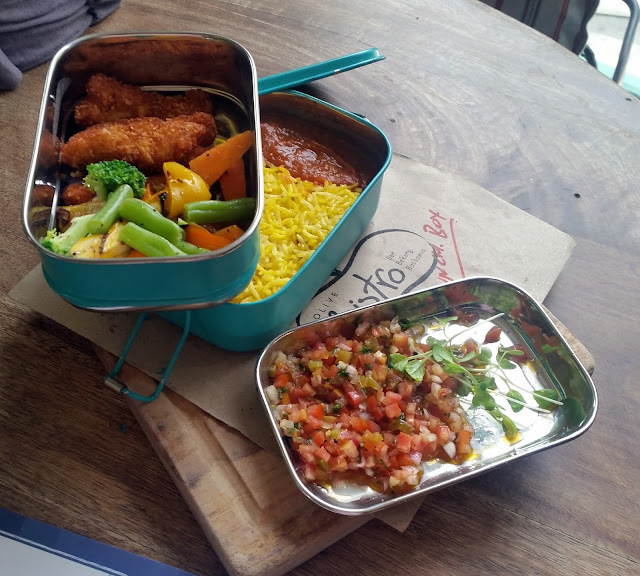 A complete post on Olive Bistro Lunch Box.